Mayor James H. McGee, 1982. Photo by Bill Shepherd, Dayton Daily News. From Dayton Daily News Archive (MS-458), VIP Files. James H. McGee (1918-2006) was Dayton’s first African American mayor, serving in that capacity from 1970 to 1981. 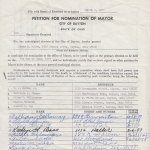 At the time he was appointed to the office in 1970, he was one of the first black major city mayors in the nation. McGee also holds the distinction of being Dayton’s longest tenured mayor with nearly 12 years in office. James Howell McGee was born November 8, 1918, in Berryburg, West Virginia, to Spanish and Perrie (Dalton) McGee. He grew up in Steubenville, Ohio, as the oldest of several children. McGee earned his undergraduate degree from Wilberforce University in 1937, after which he served briefly in the Army. He earned his law degree from Ohio State University in 1948. 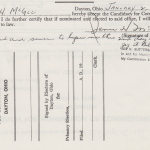 Upon graduation, McGee practiced law in the Miami Valley and became involved in Dayton city politics. He then became assistant to Congressman Rodney M. Love in the War on Poverty in 1966. 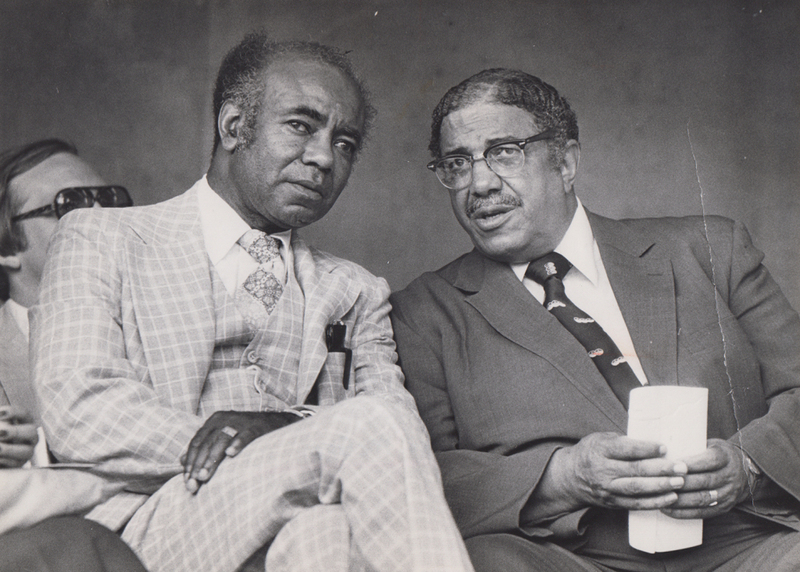 Mayor James H. McGee, right, with C. J. McLin, Dayton’s representative to the Ohio House of Representatives (36th District), 1979. Photo by Mark Duncan, Dayton Daily News. From Dayton Daily News Archive (MS-458), VIP Files. Much of McGee’s early work was for the National Association for the Advancement of Colored People (NAACP), and he was involved in several landmark civil rights cases in the Dayton area. During his tenure as Mayor, James H. McGee greatly improved the well-being of the city and testified before Congress on behalf of Dayton. He traveled extensively throughout the U.S. and abroad, on behalf of both political and civil organizations. 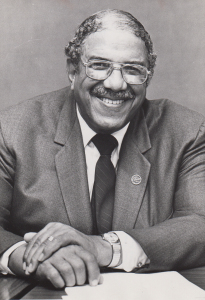 McGee was a member of various organizations including the Freemasons, NAACP, Alpha Phi Alpha fraternity, National League of Cities, Sister Cities International, and the National Bar Association. McGee was married to Elizabeth McCracken and had two daughters, Annette McGee-Wright and Frances E. McGee-Cromartie, who both reside in the Dayton area. James H. McGee died on March 4, 2006, at Covenant House Nursing Home in Trotwood, at the age of 87. He is buried in Woodland Cemetery in Dayton. The above text was adapted from the original finding aid biographical sketch written by Michael Arbagi, Tasha Hairston, and Sherri Derringer. Particularly helpful in supplying additional information were several articles from the Dayton Daily News dated March 5-10, 2006, as well as Ancestry genealogy database. 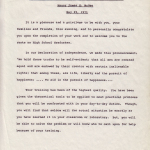 The James Howell McGee Papers (MS-322, view PDF finding aid), at Special Collections & Archives, contain materials which document McGee’s life and his dedication to community development and civil rights. 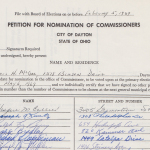 As an African American politician and the first black mayor of Dayton, his political contributions to civil rights during the 1960s and 1970s are of major importance. 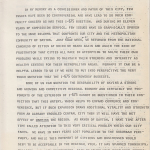 In addition to the political documents, the collection contains speeches and records of his involvement with civil rights and social organizations. This collection also preserves documentation of his domestic and foreign travels, mostly professional. The James H. McGee Papers consist of 11 boxes and 5.25 linear feet. The dates of the papers range from the late 1920s to 1995. For more information about James H. McGee or the James H. McGee Papers, please contact Special Collections & Archives, University Libraries, at archives@www.libraries.wright.edu or (937) 775-2092. 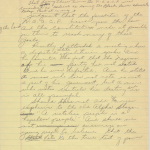 This entry was posted in Collections, Local History and tagged African Americans, Black History Month, local history, MS-322, MS-458, politics. Bookmark the permalink.